My daddy was born in January. January 3, 1912. He would be 97 if he were living. I have been thinking about him a lot this month. I imagine the picture below was made in the late fall of 1912. I love it that my grandmother's face is in the upper right hand corner of this picture. She was eighteen years old. It's the only picture I have of her before the ravages of working in the sun on their cotton farm began to show on her once-smooth face. If you look closely, you can see that he is holding some type of paper and some type of writing instrument. Curious about this, I googled "when were crayons invented" and learned that the first set of Crayola crayons debuted in 1903. So, I guess that writing instrument could be one of those early crayons. 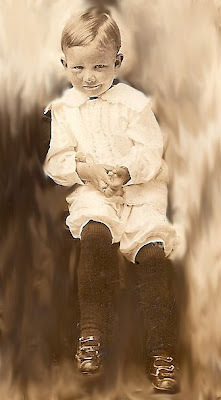 He is wearing a little dress, which was common for baby boys at that time. 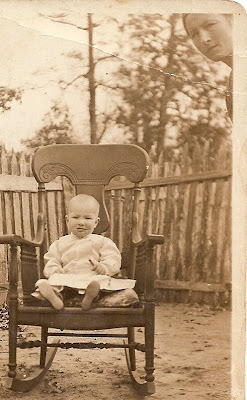 I wonder whatever happened to that old rocking chair. Over the course of the next seventeen years, my grandmother would give birth to eight more children. I imagine she got the use out of that rocking chair. I try to imagine what the day of his birth was like for my grandparents. My grandmother was 18, my grandfather 23. They had been married one year and two days, having married on New Year's Day of 1911. Oh, I have a good idea of how she felt. I know what it feels like to be a mother holding a firstborn son. Experiencing a new kind of love, so unimaginable, so all-encompassing and so powerful. I like to imagine her cuddling him in her arms, clasping him protectively to her. I imagine she felt a kind of pride in producing a son for my grandfather. I am pretty sure he would have wanted a boy. I have observed that in men, that longing for a son. My husband certainly wanted a boy. My grandfather may have wanted a boy for the reasons that so many men want a son. Someone to carry on the family name. A little guy to roughhouse with. To do manly things with, like hunt and fish. But there's another reason I think my grandfather would have wanted a son, and not just one son, but many more strapping boys. He was a farmer. A cotton farmer, with a farm to work. He needed boys to help him work the land. I imagine his manly pride on the day of the birth of the first of his children. A son, yes, a son! They named him Samuel Bruce. Samuel, for his grandfather, his great-grandfather, and his great-great grandfather before him. Bruce, for his uncle. They called him Sam. I wonder if the day of his birth was a cold, gray, wet January day like today, so common in this part of the country at this time of year. Or was it like January 3rd of this year, sunny and a warm 76 degrees? Was he born at his parents home or his grandparents home? Was he delivered by a grandmother, an aunt, or a midwife. I don't suppose I'll ever know the answers to these questions. There is no one left to ask. This is what I do know. This little boy grew up to be my daddy. He loved me. 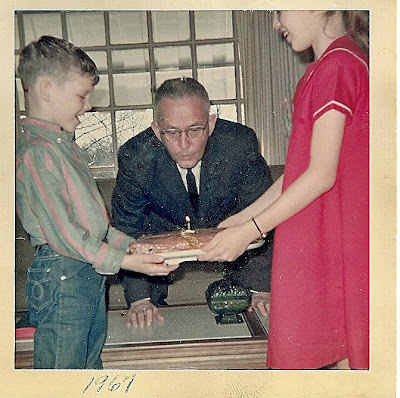 This is Daddy with Mark and me in 1967, celebrating his 55th birthday. He was reserved and quiet and did not express a lot of outward affection. But, I remember him holding me in his lap and telling me about the new room he was going to build on so I wouldn't have to share a room with my brother. I remember him sitting by my bed when I had the measles and reading aloud to me from the new Highlights magazine he had ordered. I remember coming home from school shortly after my 16th birthday and seeing a gorgeous white Mustang with red leather interior sitting in the front of the house. I remember rushing up the front steps and him meeting me at the front door. I remember throwing my arms around his neck and squealing with delight. I remember pulling back and looking at him, and seeing that he had a smile on his face and his upper lip was quivering. That was the give-away that he was really excited and pleased about something. That upper lip quivering. I remember all those things and so many, many more. He died when I was 24 and Mark was 21. It has been over 27 years now. I appreciate him in ways today that I could not when I was in my early twenties. Before I had experienced more of life and raised a boy. I know that he lives on in a far better place and that I will see him again. And yet I miss him. When it comes my time to cross over to the other shore, I expect Daddy will be looking for me. I know I'll be looking for him. And when, after all this time, we see each other again, I expect I'll run to greet him and throw my arms around his neck. He'll be smiling and that upper lip will be quivering. I love you, Daddy. I will meet you in the morning over there. This is such a sweet story, Sis. Susan! I teared up! !